Our range of products include power tiller operated 1.5 ton trolley, farm power tiller, reaper for power tiller, puddling operator, lawn mower with power tiller and reversible mould board plough. Dimension 1875mmL X 1050mm W X 375mm H.
We also offer unmatched range of 1.5 Ton Trailer For Power Tiller to our clients, which is manufactured using premium quality raw materials and advanced technology. The chassis of our range is made of 50mm X 50mm MS Angel and Yoke/Tow bar made of 72mmX72mmX5mm sq pipe. The bottom sheet is made of 2mm MS Sheet and side body is made of 1.5 mm MS Sheet. Further, the side body is corrugated for additional strength and axle is made of 50mm sq shaft. Our range is facilitated with efficient mechanical operated brakes, 6x16 branded tyre and also has suitable discs with seat. Body size:1875mmL X 1050mm W X 375mm H.
The huge range of farming and agricultural machinery we provide is widely used for many agriculture applications. These power tiller are perfect ones for the small and big farms. 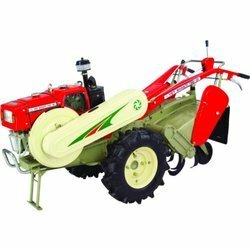 The Farm Power Tiller is one of the best agriculture implements we offer its highly useful after paddy harvesting of land. 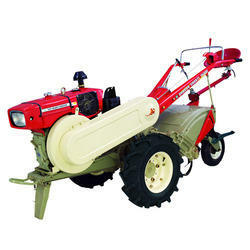 We are engaged in offering a qualitative range of VST - Shakti 130 DI Power Tiller. These are sourced from trusted vendors in the market. 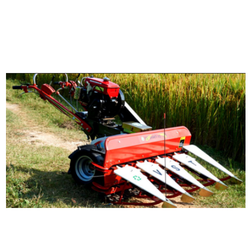 Our range of tillers is based on advanced technology and meet international standards. Furthermore, with the support of our vendors, we offer our range at competitive prices. Horizontal 4 stroke single cylinder water cooled diesel engine. The Power Tiller Operated Transmission Drive Reaper is used for harvesting both line planted & random planted crops of Paddy & Ragi. This unit cuts and wind-rows the crop in a straight line for easy collection. It works better on dry land. Puddling operation is done before transplanting the paddy seedlings. For this field operation power tiller is fitted with Lugged wheels or drum type cage wheels depending upon the soil conditions after removing the Rubber Tyres for better traction. Rotary is fitted with Bent tynes. Tail wheel is also to be replaced with tail wheel float for adjusting the depth. Minimum two puddling operations are required and at least 8-10 cms of water should be available in the field for best puddle and proper levelling of the field. 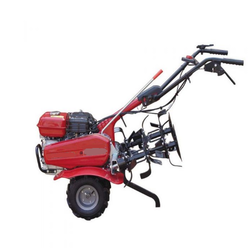 We are offering Lawn Mower with Power Tiller to our client and our product is made of good quality. Reversible mould board plough is primarily used to plough virgin fields,fields that are left unploughed for long periods,fields that are too hard,full of deep routed unwanted plants,shrubs,weeds etc. We also provide a superior range of Powertiller attachments to our clients. Plough can be attached with the help of Hitch bracket. Depends on soil condition & usages. 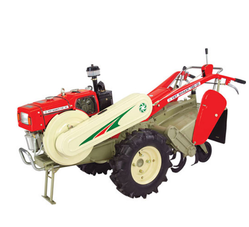 We are engaged in offering a qualitative range of agriclulture machinery like VST - Shakti Dragon 150 DI Power Tiller. These are sourced from trusted vendors in the market. Our range of tillers is based on advanced technology and meet international standards. The offered farming implements are not only saves time but the labor cost is saved, so they are overall decreases the input cost and help yielding the effective crops. Furthermore, with the support of our vendors, we offer our range at competitive prices. In case of dry tilling either bent or straight tynes can be fitted depending upon the moisture in the field. Normally this operation is done immediately after harvest to remove the roots or removing the weeds in the field or loosening the soil for better aeration. Dry tilling is also done prior to planting seeds for dry crops such as Ground nut, jowar, chillies etc. Also for intercultivation, dry tilling operation is done. We also provide a superior range of Power tiller attachments to our clients. Five types cultivator can be easily attached with Power tiller with help of Hitch bracket. Five types cultivator fittment is commonly used as secondary tillage equipment mostly in dry lands for loosening the soil , removal of crop roots,weeds and for inter cultivation in orchards etc.A little moisture in the field increases the tilling efficiency. Depends on soil conditions & usages. With the help of our vendors, we offer a comprehensive range of Mitsubishi shakti VWH-120 Power Tiller to our clients at industry leading prices. These agricultural implement - power tillers are available in various specifications and meet the individual requirements of our clients in the best possible manner. Our range is highly appreciated by our clients for durability, high performance and user friendly nature. The ridger is used for making ridges for raw crops such as sugarcane,patato,chillies,tabaco,banana ets as well as for opening furrows for water flow.The ridger should be used when the soil is slightly moist and used only after tilling the land once or twice. The ridger is fitted on the Rotary assy with the help of a special bolt & nut. Looking for Power Tillers ?